Patients who come to our practice with a chipped tooth or a bad cavity can count on us to offer help. We're a leader in restorative dentistry treatments in Woodinville, always doing our best to reduce pain and discomfort while improving smile aesthetics. While many people are familiar with tooth decay and fractures to the teeth, they're less likely to be aware of dental abfractions. Let's go over the basics of abfractions and then discuss methods of treatment. A dental abfraction refers to a small notch that forms at the base of the tooth where it meets the gums. These kinds of hard-tissue lesions often start as angular but can become rounded or curved over time. The term "abfraction" was originally coined in 1991 to refer to these lesions. They are distinct from tooth decay and dental erosion that you may be familiar with. 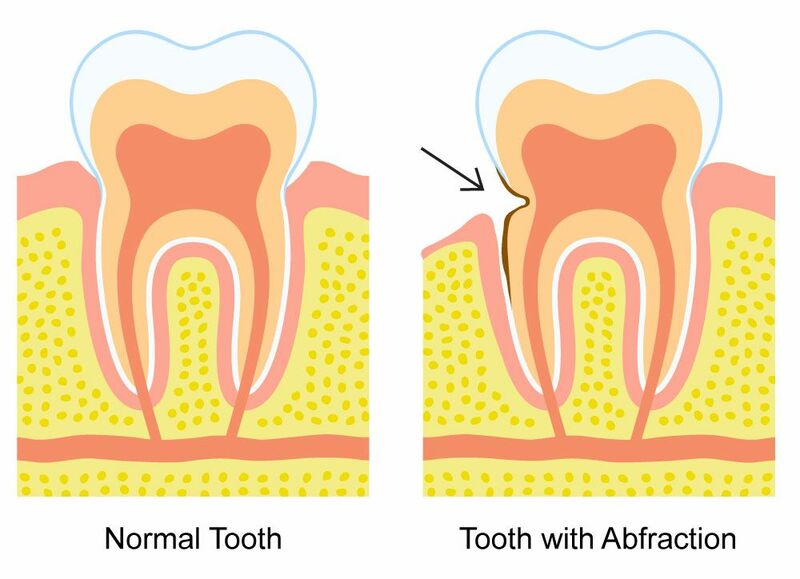 What Are the Dangers of Dental Abfractions? Dental abfraction wears down the enamel of the tooth at a particularly vulnerable area. As abfraction occurs, patients will notice increased problems and risks with tooth sensitivity, tooth damage, and tooth decay. This also leads to an increased likelihood of fractures and chipping in addition to greater sensitivity when having hot or cold foods and beverages. It's ideal for dental abfraction to be treated as soon as possible in order to prevent serious dental health problems. There is some ongoing debate in the dental care community about the actual origins of dental abfractions. Some dentists believe that abfractions are the result of natural pressure that is applied to the teeth each day. This means that the natural wear and tear to the teeth from biting and chewing results in the lesions appearing and developing. Other dentists feel that abfractions are the result of mechanical stress applied to the teeth, such as the pressure of a toothbrush against the teeth. Over time, the enamel wears away at the gumline. In general, both of these factors play a part in dental abfraction, but the exact cause may be a chicken-or-the-egg scenario. As more research into the causes of dental abfractions occur, we will be sure to share that information with patients. When it comes to treating dental abfractions, the most common approaches involve the use of a tooth-colored filling or dental bonding. In each of these cases, the missing tooth structure is restored and done so in a manner that is aesthetically pleasing. Patients will smile with confidence and not have to worry about tooth sensitivity and pain. In addition to restoring damaged tooth structure, dentists will also use various methods to prevent further problems with abfractions in the future. Patients with crooked teeth or who suffer from teeth grinding can have those issues looked into in greater detail. By reduced stress and pressure on the teeth, future abfractions can be prevented, or at least their formation will bu much slower. During the consultation process, we will be able to discuss all of your options for treatment in much greater detail. For more information about dental abractions and how tour team can help you deal with these issues, be sure to contact our cosmetic and restorative dentistry practice today. We will work closely with you to improve your dental health and wellness.